From its formation in 1947 with one station, the Fire Department has grown to six stations and utilizes the latest in firefighting equipment. Over 30 units include pumpers, ladders, brush trucks and other specialty units with hundreds of specialized tools. Air truck and Haz-mat: This self-contain breathing apparatus service vehicle holds special long use (one hour) and emergency (five minutes) bottles. On scene, prefilled spare bottles are swapped as the used bottles refill. The truck is also setup for a confined space rescue and will provide air to a firefighter through a hose that is connected to a bottle on the surface. An emergency bottle is also carried, in case the main air supply fails. ATV: This ATV is a 2-person Polaris Ranger 6x6 800 EFI. It can haul equipment, be used in search-and-rescue operations and at special events. Engine Company E-2: E-2 is the newest pumper at the City of Bloomington, going into service at the beginning of August 2013. Currently, nine engine companies are placed throughout the six BFD stations. E-2 was built by Rosenbauer General Safety Fire Apparatus in Wyoming, Minnesota. It can pump water at 2000 GPM (gallons per minute) and hold 750 gallons of water. It will carry hose and tools to assist firefighters when responding to emergencies. E-2 responds out of Station #2. Ladder 4: L-4 is the newest ladder company in the city. 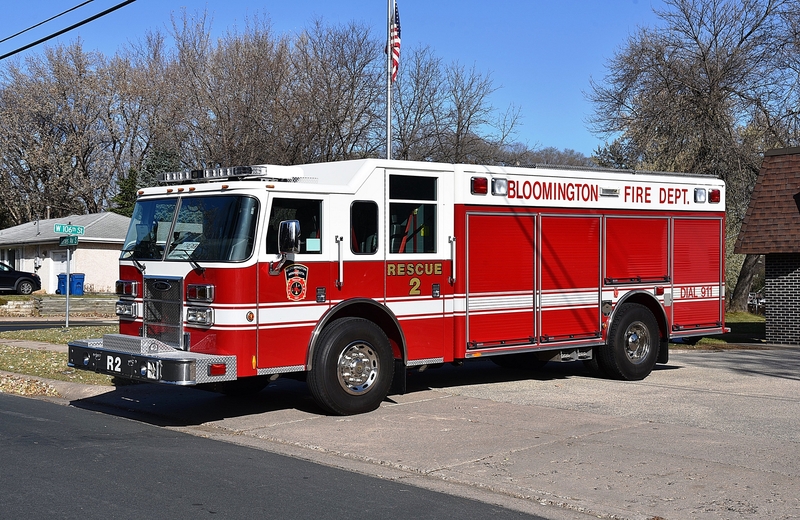 It was built by Rosenbauer General Safety Fire Apparatus in Wyoming, Minnesota and placed into service in 2008. L-4 has a 105’ rear mounted ladder and a 2000 GPM pump. L-4 carries tools and equipment that supports fire and rescue response. L-4 can transport up to six firefighters and responds out of Station #4. Zodiak boat: This inflatable raft is used by the Dive Team for water and ice rescues. It has a 25-hp motor and contains rescue and diving equipment. Brush truck: This truck is equipped with a snowplow blade for clearing the station lots. The truck carries enough water to fight a small house fire. The truck's main use is on brush fires. Two types of hoses can be used at the same time, making this a quick and effective tool for containing grass and woodland fires. Haz-mat #1: Built by Pierce Manufacturing , Haz-mat #1 is located at Station #1 and responds to all hazardous materials incidents. It carries equipment and tools to contain/mitigate hazardous materials. It carries up to six firefighters. Ladder 1: L-1 is one of six ladder companies in the city. Each station has a ladder company. L-1 is a 2001 95’ platform built by American Lafrance/LTI. L-1 also has a 2000 GPM pump and can transport up to six firefighters. L-1 carries tools and equipment that supports fire and rescue response. L-1 responds out of Station #1. Ladder 5: L-5 is a tractor drawn tiller ladder company. It takes two firefighters to drive the apparatus as it needs a firefighter in the rear tiller cab to steer the trailer. L-5 was built by Rosenbauer General Safety Fire Apparatus in Wyoming, Minnesota and placed into service in 1999. L-5 does not have a pump but carries tools and equipment that supports fire and rescue response. L-5 can transport up to six firefighters and responds out of Station #5.